Along the western coast of South America there's a vast desert so unimaginably parched it's effectively hell on Earth – but it's the similarities to another red destination that have scientists hot and bothered. Chile's Atacama Desert is among the very driest places on the planet, so arid that rain may not fall on it for decades or centuries at a time. This makes the hostile landscape about the closest thing we have to Mars on Earth – and scientists just made a big discovery about it. 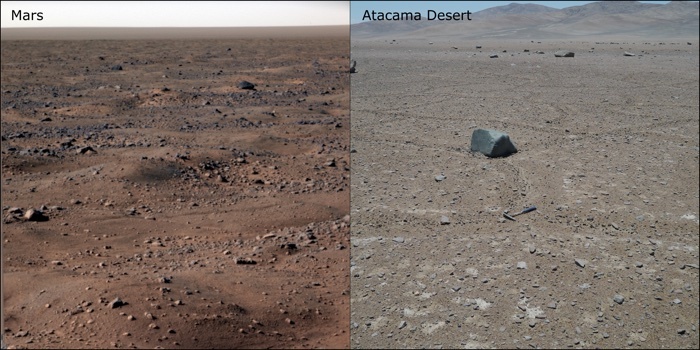 For the first time, researchers have observed microbial life rebounding in the incredibly dry core of the Atacama, demonstrating that this dusty, scorched environment is in fact – against all odds – an ecosystem. For hopes of ever finding life on Mars, that unlikely discovery could mean everything. "It has always fascinated me to go to the places where people don't think anything could possibly survive and discover that life has somehow found a way to make it work," says planetary scientist Dirk Schulze-Makuch from Washington State University. "If life can persist in Earth's driest environment, there is a good chance it could be hanging in there on Mars in a similar fashion." It's not the first time microbes have been detected in the Atacama Desert, but previous research left open the possibility that any life discovered in the sandy soil could be "dead or dying vestiges of viable cells fortuitously deposited by atmospheric processes". This time around, researchers found actual evidence of a localised, metabolically active microbial community thriving – or at least surviving – in the dirt, but as so often happens, great science depended on an ever greater bout of luck. Shortly after Schulze-Makuch and fellow researchers arrived on site in 2015, the skies opened and rain fell in the desert – an incredibly rare event, producing the greatest precipitation in the region since official recording began almost 40 years before. After this improbable deluge, the researchers detected an explosion of biological activity in soil samples extracted from eight sites across the desert. The researchers returned for follow-up investigations in 2016 and 2017, but while they came back, the rains did not, and the signs of life began to disappear in the later samples. Nonetheless, a combination of genomic tests and chemical analysis suggest the microbes evolved in the specific soil where they were found. These hardy bacterial communities lying a couple of feet below the desert's surface suggest the microbes may survive a very long time between drinks – entering a kind of metabolic stasis to last out epic periods of dryness until moist conditions resume. "This is really the first time that anyone has been able to identify a persistent form of life living in the soil of the Atacama Desert," says Schulze-Makuch. Of course, it's worth bearing in mind that as harsh and unforgiving as Atacama might be, it's still no Mars – which is inconceivably drier and colder. Still, if scientists were looking for a new hope of ever finding life on Mars, these thirsty Chilean sand-microbes just might be it – as they're the closest thing we have to a template for whatever biological activity might exist on the Red Planet. "We know there is water frozen in the Martian soil and recent research strongly suggests nightly snowfalls and other increased moisture events near the surface," Schulze-Makuch says. The findings are reported in the Proceedings of the National Academy of Sciences.